Our range of ALPO electric tractors aims at redefining the concept of a tractor. The idea is to support farmers on their way to soil-friendly agroecological approaches by putting soil back on the centre stage. This range boasts unprecedented versatility and modularity. Our tractors weigh from 500 to 950kg and deliver 25 to 50 electrical HP. They can take care of all cultivation operations (tillage, crop establishment, crop maintenance, harvesting, transport, handling and building maintenance). With a battery life of over eight hours for less than two hours charging time, our machine does the job using ten times less energy than a conventional tractor. Our range is suitable for all category 1 tools hitched using the three-point linking system or a quick-hitch triangle. Farmers can still use their own equipment fleet. Lifting is possible in 3 locations: front (250kg), central and back (400kg). ALPO’s range of electric tractors meets all the requirements of farming businesses, from winegrowing to field crops through to livestock farming, market gardening and specialised crops. 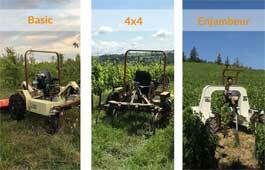 Each ALPO electric tractor is tailored to meet the specific needs of each farmer.